South Central Bike Fest kicks off Thursday June 6th and runs through Saturday night, June 8th. 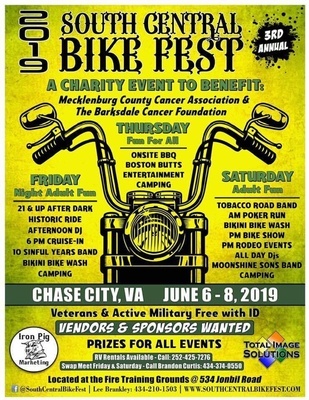 This is a charity event to benefit The Barksdale Foundation & Mecklenburg County Cancer Association. Enjoy the BBQ & entertainment Thursday evening then join the historic ride Friday afternoon, followed by a Cruise-In and Live entertainment at night. Saturday fun begins at 9am with a Poker Run (cash prizes). The Bike Show starts at 1pm while rodeo events are playing throughout the grounds. Several LIVE bands will play throughout the evening and night. **Age restriction apply. See details on website.